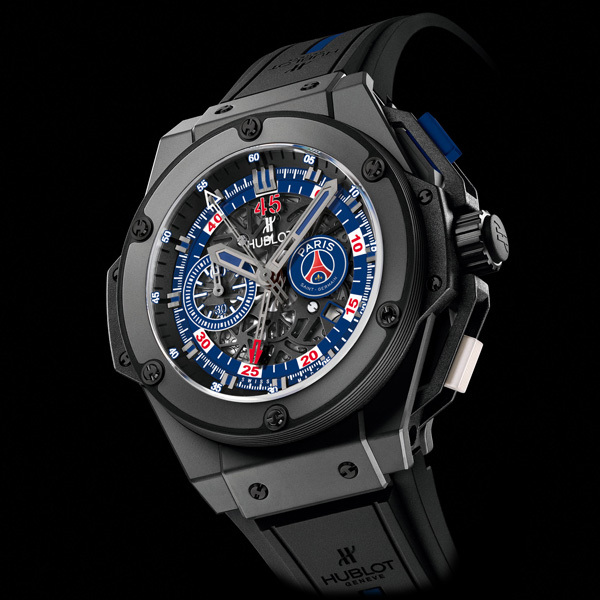 Following the official announcement on 26th September 2013 of the partnership between luxury Swiss watch brand Hublot and Paris Saint-Germain, French Ligue 1 Champions, Hublot is today delighted to present the official club watch. 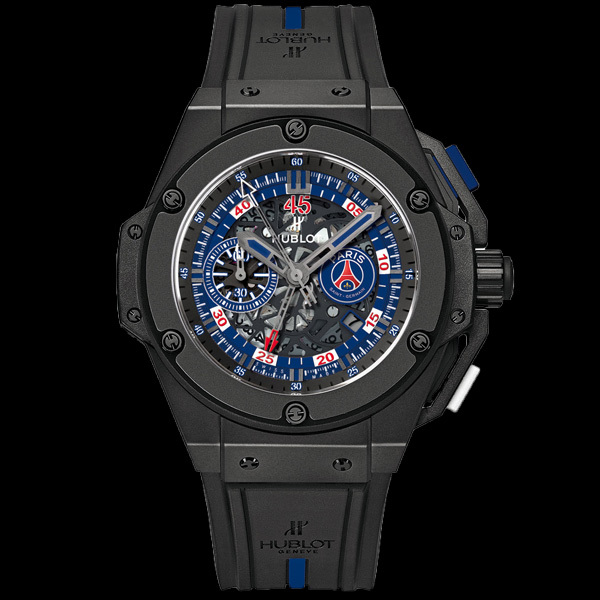 As Official Timekeeper for Paris Saint-Germain, Hublot opted for a symbolic unveiling of the official club watch - the aptly named King Power Paris Saint-Germain - at the Ooredoo training centre. 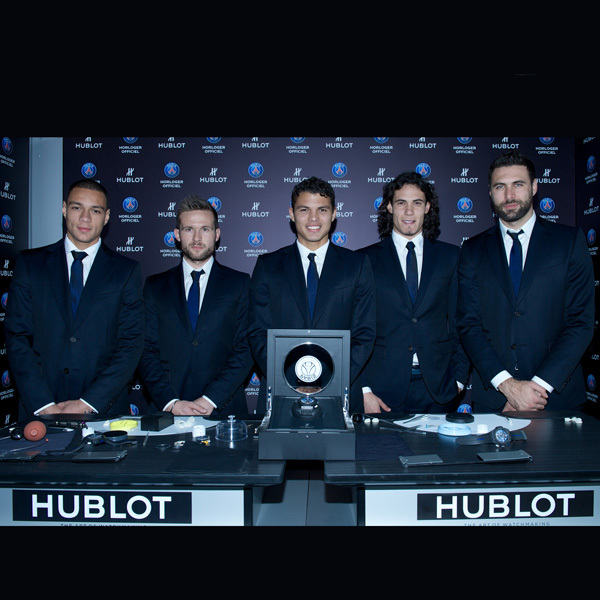 The event featured an exclusive appearance from players Edinson Cavani, Thiago Silva, Yohan Cabaye, Gregory Van Der Wiel and Salvatore Sirigu, who were invited to take part in a Hublot Watch Academy workshop, with assistance from a professional watchmaker. There was plenty of good humour in evidence during the unique event held at the training centre. A Master Watchmaker even made the journey from Switzerland to answer the numerous questions prompted by the watch's unveiling. In line with Hublot's cherished ethos "To be first, different and unique", the event had a decidedly Swiss flavour, with the Ooredoo training centre playing host to a Hublot cow and Alpine pasture-style decoration to evoke the brand's homeland. Paying tribute to the famous club's iconic blue and red colours, Hublot has developed a King Power equipped with a chronograph movement featuring two chronograph hands positioned in the centre, in addition to the hour and minute hands. This makes for better readability - quicker and more efficient. The wearer can keep track of both hands at a glance; the first indicates the seconds, and the other hand, specially developed for football, indicates the time elapsed out of the 45 mins in each half. With a sapphire dial, the movement – here in an Aero Bang version - features exquisite new skeleton working to reveal even more of the working parts of the watch and its fine mechanics. The topside retains only the material necessary for it to function. This is coated with black ruthenium for a beautiful overall effect of homogeneity, and clearer reading. A minute track, a time counter at 9 o'clock and a date window at 4 o'clock all feature on the predominantly blue piece, which is stamped with the famous Parisian emblem incorporating the Eiffel Tower. Much attention has been lavished on the King Power case, which is 48 mm diameter in highly shock-resistant micro-blasted black ceramic. The moulded black rubber crown is flanked by two push-buttons in blue and white rubber. In a final reference to the club, and adding an attractive touch to the piece, the black rubber strap is decorated with a central blue line directly inspired by the Paris Saint-Germain graphic charter. The chronograph is available in a limited edition of just 200 numbered pieces. An exclusive timepiece in the club's colours, which pays tribute to the passions and values it shares with Hublot. Each watch comes with a certificate guaranteeing its authenticity and an official Paris Saint-Germain shirt signed by all the players. 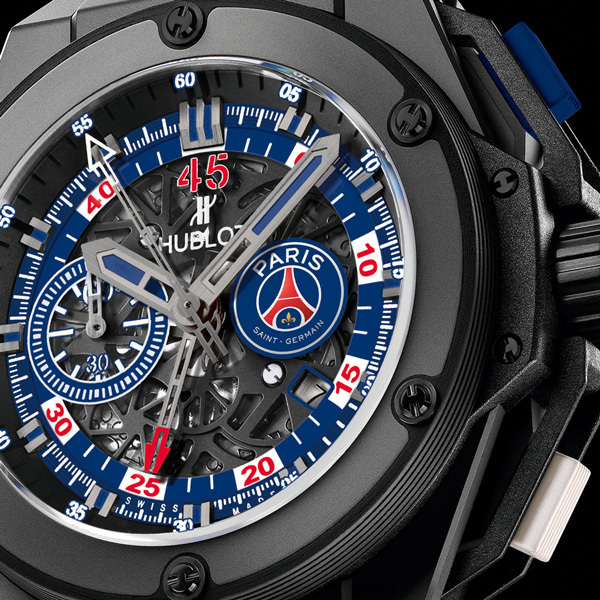 In September 2013, Hublot was appointed Official Timekeeper and Official Watch for Paris Saint-Germain. This will provide the Swiss brand with a strategic presence within the Paris club's grounds, at Parc des Princes. The public will be able to watch the match time count down on the Hublot chronometers on the upper level LED perimeter displays, and a number of clocks will also be installed at key locations in the stadium. Thanks to this partnership, Hublot is continuing to strengthen its presence in the world of professional football. The first luxury brand to become involved in football in 2006, Hublot has since then worked in close collaboration with FIFA as Official Timekeeper and Official Watch of the FIFA World Cup™ - the countdown has already started in Brazil, visible to all on the giant Hublot clocks designed by the celebrated architect Oscar Niemeyer and installed on Copacabana beach, Rio de Janeiro, in Brasilia and in Sao Paulo. Also the Official Watch of Euro 2012, Hublot now works very closely with a number of clubs, including Bayern Munich in Germany, Juventus in Italy and Ajax in the Netherlands, to name but a few in Europe.